Do you want to live in a barn house with a beautiful contemporary appeal? Imagine living in a place with the scent of dirt and fresh cut grass while you are looking at a vast space with greens everywhere. There might even be chickens who are happily roaming around the area or a few goats jumping under the sun. You could also see some dandelions whipping in the slight breeze as some parts of the grass are overgrown. 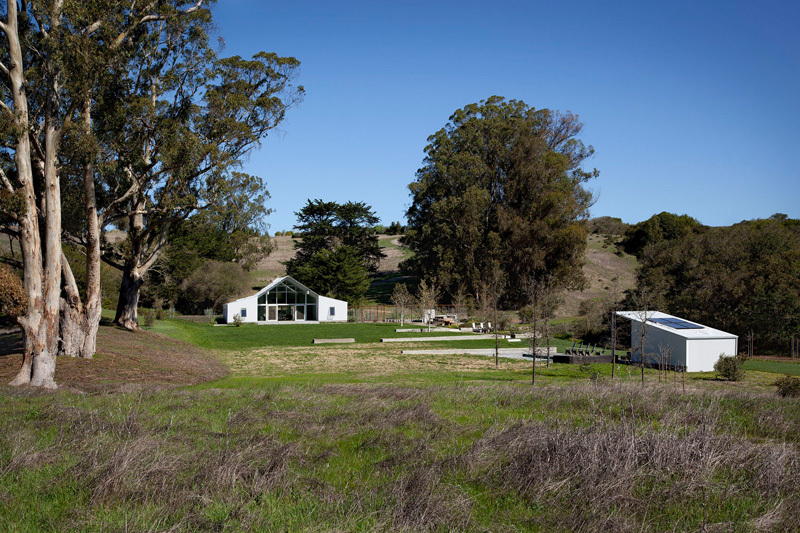 Yes, it would be nice to live in a ranch and in a barn with all the natural beauty around it. And even in today’s modern style of living, you can still get a house similar to what I have described. To be honest, what came to my mind is a scene similar to that of Cinderella’s house, but of course, minus the talking mice and the birds who can give you a sponge bath. Today, we are going to feature a barn house. Well, not necessarily the usual barn house with all the animals, but the type that looks beautiful and relaxing with oneness to nature. 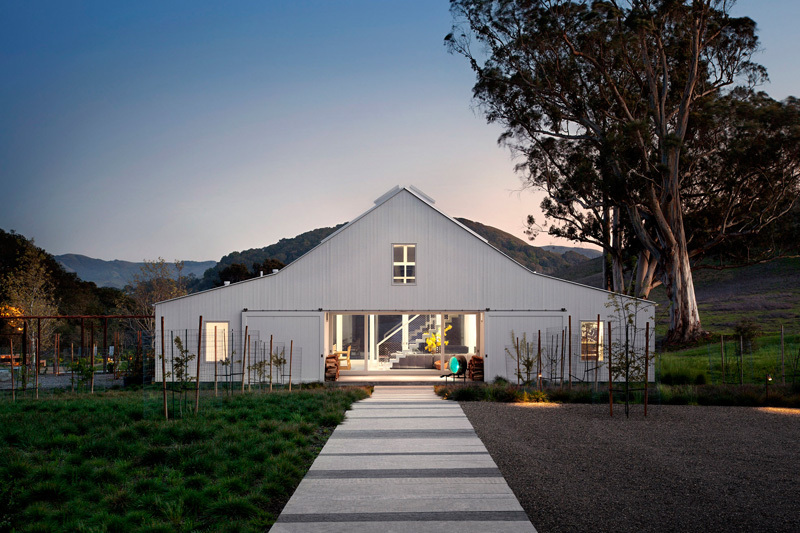 This barn house is owned by a young couple who calls the place as Hupomone Ranch, located on an original 160-acre homestead in the Chileno Valley, near Petaluma, California. 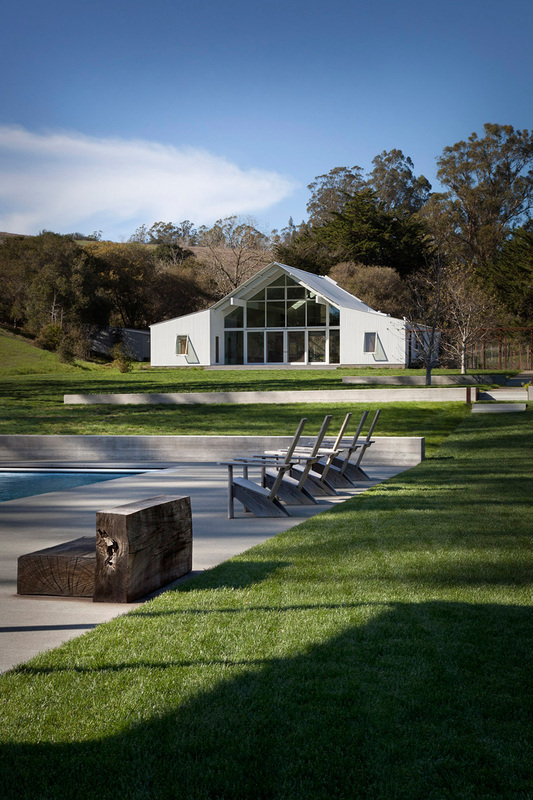 It is designed by architecture firm Turnbull Griffin Haesloop who were tasked to build the barn house the young family with three children. Meanwhile, its interior design was done by Erin Martin who made sure that the interior will compliment with the flow of indoor/outdoor living. The interior also features a light-filled living area which opens up to the long view south. There are also bedrooms and a kitchen to either side. If you look at the exterior, you can see that it is indeed a barn house but once you are inside, you will be amazed of the kind of lifestyle it can offer the family. Let us take a look at the images of the house below. Unique feature: A contemporary barn house that offers both the comfort of nature and modern living. When I first saw this one, what came to my mind are the farm animals of “Old MacDonald.” You know, the nursery song that kids love to sing. But this one is different because even if it has a barn design, its look has a contemporary twist in it. Even the interior looks amazing as seen from this view. Because of the design of the roof, the house has a high pitch which is covered in glass allowing light to enter the home. And apart from its brightness, you can also notice that the home has beautiful interior as it features an eclectic mix of modern furniture. Notice that the center table has a lovely centerpiece in it. That huge portrait sure is an eye candy in the living room and will draw attention from anyone who gets inside. Apart from that, I like that stainless floor lamp and the combination of yellow and gray in the throw pillows that sits on the comfy dark gray sofa. Since the ceiling is tall, it allows a mezzanine in it where you can find a seating area. I can tell that there is also a bedroom on the sides too. It would surely be nice to stay on this place! 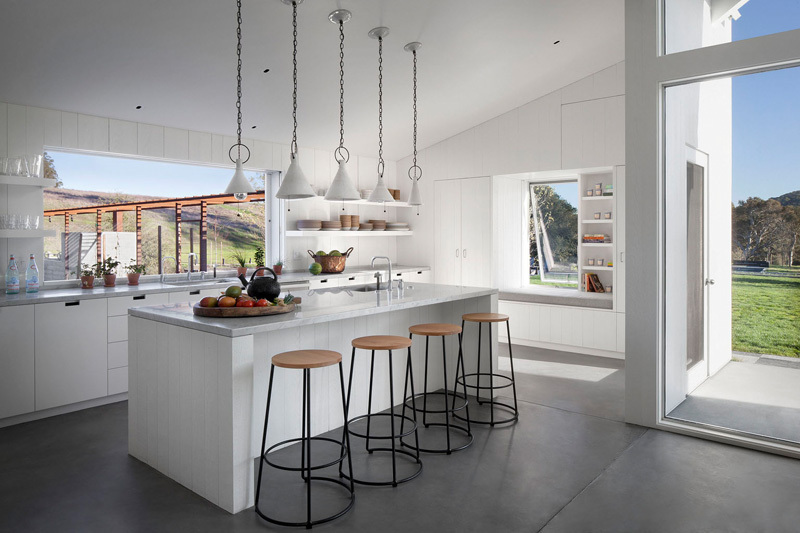 The kitchen is also in white with some wooden features from the stools. The design has a subtle industrial look too. It has slide away windows that open directly to the garden which is a good way to connect the interior to the outdoor area. 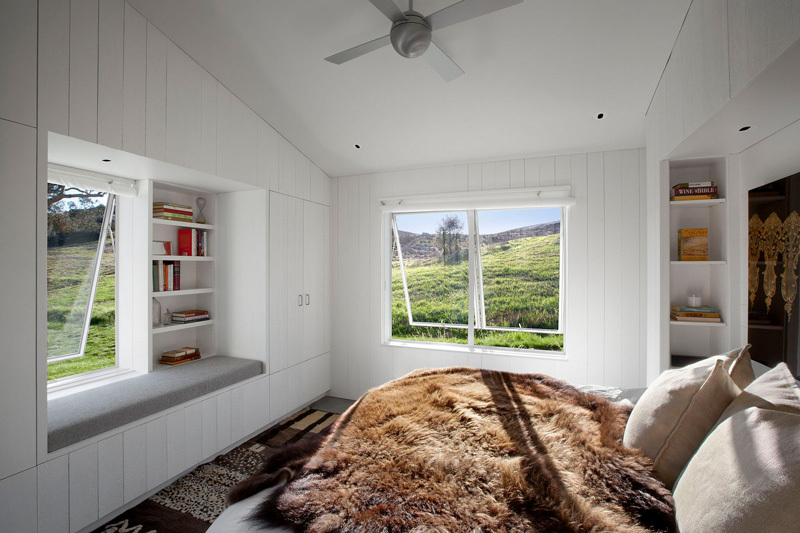 This bedroom looks very relaxing as it offers a view of the beautiful outdoor scenario. It features a custom built-in window seat and bookshelf. The bathroom also has views of the surrounding area. Indeed, it is perfect for relaxing while in the bath. Notice that the bath tub has black and white colors in it which is a good contrast to the white colors of the space. Also, I like it that there are little potted plants added to the area. If you love to stay outdoors, you would love this place! Just look at this pool area with wooden chairs around it and yes, all the greens look very refreshing as well. That chair made from wood is a good DIY idea for an outdoor seating and it will also be a nice way to recycle wood that are no longer used. Outdoors, near the pool area is an additional building that houses an outdoor kitchen. 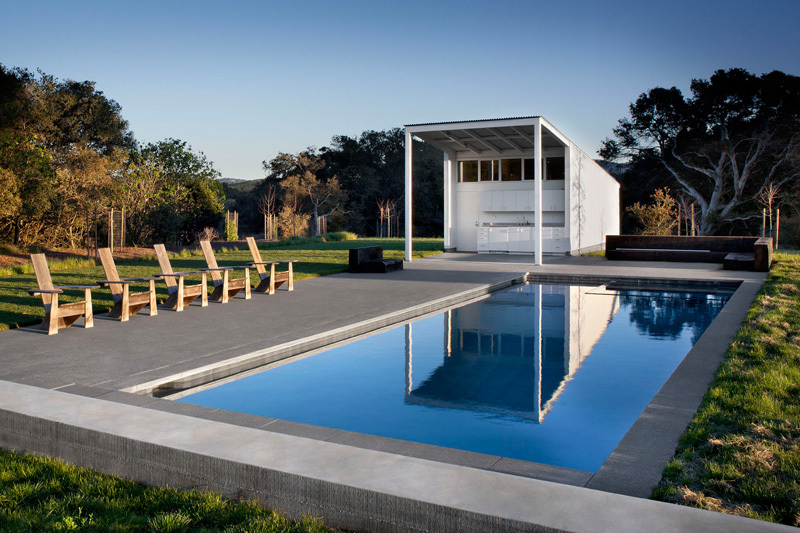 The pool may be simple but it does bring a lot of beauty not just to the outdoor area of the house but to the entire ranch as well. I can see that one will surely feel relaxed white in here since it is surrounded by nature’s appealing beauty. Such a lovely place to live! And it has a spacious area too. You can just imagine that the kids can play and run around it. But I do not see a hint of pigs or cows or even chickens. Well, it isn’t the usual barn after all. But then again, we might not get to see the other side of the home. Who knows, they might indeed have the heart for taking care of animals! Love the look of this one especially that it has greens all around it! Just perfectly stunning and comfortable indeed. I would love to live in a home similar to this. It is like you can breeze fresh air while still living the kind of life you want with modern equipment and appliances inside a comfy home. Applause to the Turnbull Griffin Haesloop architecture firm and interior designer Erin Martin who did an amazing collaboration to come up with a wonderful home like this. Now it is your turn to speak up. Let me know what you think of the Hupomone Ranch and which features in it do you like the most.